I quite enjoyed it, but it's nothing special. If you fed all of Japan's anime into a blender, it might look like this. Schoolgirls turn into magical girls and fight extra-dimensional aliens, because only schoolgirls can save the world! 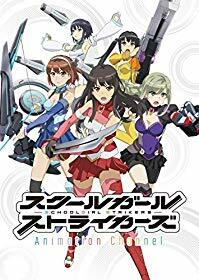 There are also about two dozen girls, because this is based on a social network game and the anime couldn't bear to exclude a single one of them. There's an amnesiac girl! There's some very tame fanservice! Some of the comedy's mildly amusing! There are villains who can be defeated by befriending them, but you'll be in trouble if the supervillain gets her hands on them again! More seriously, though, the series got better as it went along. Ep.2 was gloop. It's shallow characters doing bland things. However I enjoyed the later episodes, which improve the format by adding villains and even some drama. The heroines aren't particularly interesting. They're fine and I warmed up to them, but they're mostly just nice. Some can be haughty and some can be goofy, but that's about it. However we also have some villains, who wake you up about halfway through. There's a gang of three sisters who are actually nice, but they're very grateful to Morgana for everything she's done for them and wouldn't dream of disobeying her. (Morgana is the apocalypse. You know how villains often threaten to destroy the world? Morgana's already done that once before.) Anyway, those sisters are both: (a) frighteningly tough and capable of flattening an entire team, and (b) dirt poor and in always looking for food. Best of all, though, is Odile. She's awesome. She's a comedy klutz who embarrasses herself pretty much any time she opens her mouth, but she's also our heroines' nemesis (in her opinion) and she's capable of drop-kicking untouchable extra-dimensional superbeings who can see the future. Odile made me laugh a lot. This is a mildly incoherent show, cheerfully rattling all over the place. Goodness knows what's supposed to have happened in the last episode, but the volleyball made me laugh. This show is capable of sending everyone on holiday to the mountains and doing comedy Yeti, even though we're almost at the season finale. There's a swimsuit episode. There are quite a lot of shower and hot spring scenes, but you never see anything. (The comedy modesty-preservation in ep.11 is another thing that made me laugh.) The show's generic in a lot of ways, but it's quite likeable and after a rough start I think it even managed to cope with its oversized cast. I can see completely why lots of people dropped this show early. I was nearly one of them. Having fought my way through those early episodes and now reached the end, I think I've become modestly fond of it. The baddies are what lift it up.